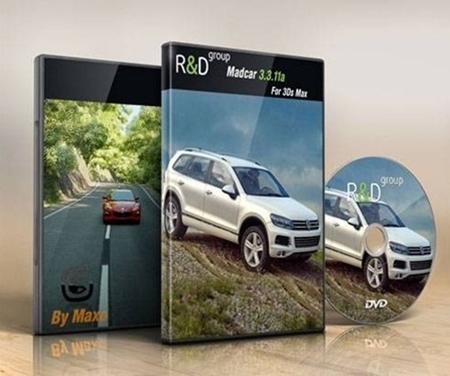 MadCar 3 is a plug-in for 3DS Max for quick rigging of wheeled vehicles and their animations by simulating the control. This new version allows rigging vehicles with any number of wheels, and with any of their mutual arrangements including motorcycles. Any number of trailers is also supported. There are simplified behavior setting for each of the wheels and suspension as well as fine tuning, this allows to simulate motion with qualities of a race car as well as heavy trucks. Animation is created during the simulation in real time. Simulation can be controlled by the keyboard, joysticks, game controllers, or steering wheel. “Following the object” mode is also supported. The package also includes a procedural map that generates traces of tires on the surface on which vehicle is moving (V-Ray only). Features:- *any number of wheels, with any of their mutual arrangements *including motorcycle rigging * New helper “Power” can simulate any external forces * New helper “Collision Sphere” help to simulate collisions between ground and any part of your vehicle.